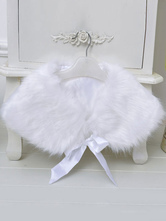 Buy the best flower girl accessories on Milanoo.com. Shop for cheap flower girl Headband , Gloves, Wraps , Jewelry, Purses, Baskets and other accessories online. Got everything your flower girl will need for your wedding day. This fit my daughter perfectly and looked exactly like the picture. Very nice and soft. Perfect for what it needed for. Granddaughter loved it. Super fast shipment. The head flower arrived four days earlier than the expected date. And it is really gorgeous. I love it very much. Thank you. This cape is perfect accent for sleeveless or short sleeve dresses. The white is very pretty and it fits well. I brought small for my 5 year old and X-larrge for my 10 year old.